This was a good day for humming that old Johnny Ray song, “Just walking in the rain.” It was actually the first day that the sky has been completely overcast with no patches of blue anywhere. It was windy as well in the afternoon and the autumn leaves were flying! At least it was the shortest walking day so far, all of it being alongside the main road between Villalcazar and Carrion. 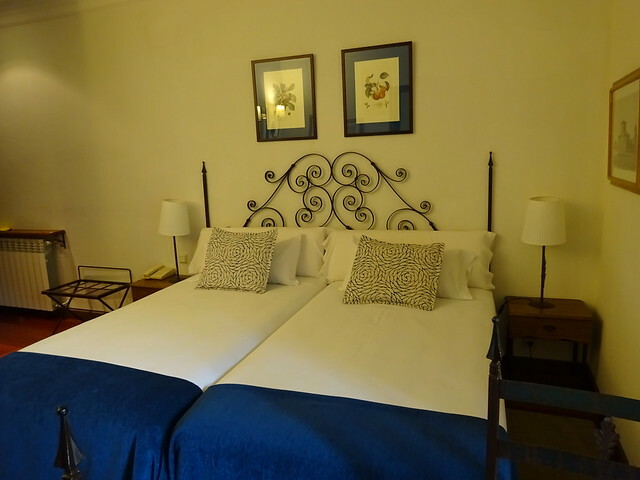 The reason we walked only 6.6 km is because we wanted to stay at the Real Monasterio de San Zoilo Hotel. The monastery was built in the 11th century, has been restored as a hotel and is a national monument. What better place to relax and let it rain if it wants to. 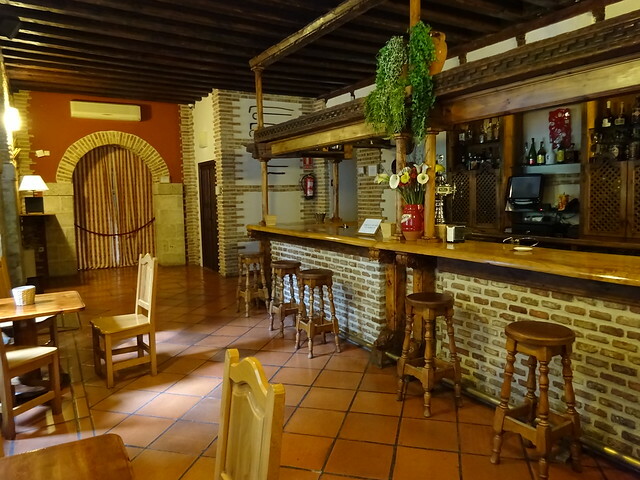 Carrion de los Condes is a charming town that retains a medieval atmosphere. In the “good old days” it was home to no fewer than 14 pilgrim hospitals. It was effectively the capital of much of the “tierra de campos” (land of fields) area and ruled by the Leonese Beni-Gomez family and the Counts of Carrion. Several of the counts met a premature death at the hands of the equally pugnacious El Cid, after they reputedly and very unwisely mistreated his daughters. We may stay here in Carrion for another night, partly because of the weather and also because Dave isn’t feeling well. Hopefully when the “farmacias” open tomorrow, he can get medication for what is ailing him. Since we didn’t really do much today so don’t have much to write about or many pictures to post, we have room to make some observations about happy people! 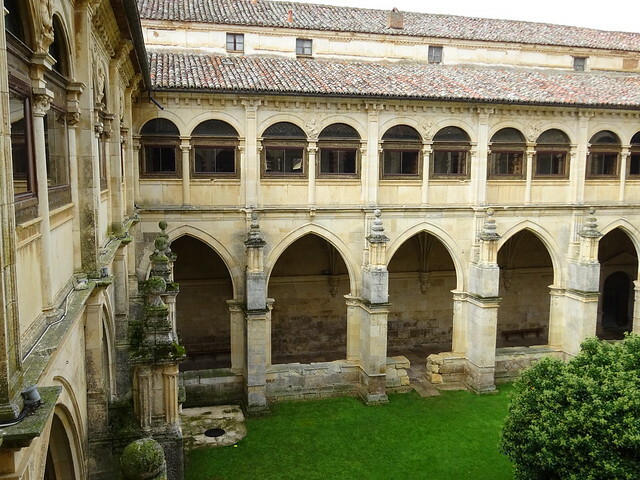 The most welcoming and happiest hospitalieros were at the San Esteban Municipal Albergue in Castrojeriz and at the albergue which is run by the collegiate church in Roncesvalles. We received less enthusiastic welcomes with no smiles at hotels. Could it be that they think we are bringing bedbugs? Making an attempt to speak Spanish, even if we get it wrong, is always appreciated. In Santo Domingo we had a waiter who didn’t smile. I had enough vino tinto in me to give me courage to order our dessert very slowly and completely in Spanish: “Quiero comer arroz con leche y mi esposo quiere comer helado, por favor.” Suddenly he was all smiles, squeezing my shoulder, and happily chattering about how I could say “mi merido” or “mi esposo” and they were both correct. Peregrinos at the beginning of their pilgrimage seems much happier than later on. At first they are excited at having an adventure and hopeful that their journey will be everything they wished and planned for. Now at about the half-way point, things have become “old hat.” There are fewer smiles, less meaningful “Buen Caminos,” and less eye contact. Maybe peregrinos get happier once again when they are getting closer to Santiago. We will find out. Hotel looks really nice. Was a bit surprised by all the “fries” at meals. Many years ago when in Spain we were served rice more than potatoes. I am Jen’s mom of the Jen and Grace you have befriended on your adventure. You just missed them by a day as they stayed at the Monastery 10/2 & 10/3 and are now in Terredillos. I wanted to thank you for being so helpful to Jen! Just when she was having a moment you arrived and made such a difference! Thank you, thank you for being there for her!! Enjoy your respite in what looks like a rejuvenating place and I hope David feels better! Jen said you write beautifully and I agree!! How sweet to hear from you! Our paths kept crossing for a reason and, if I was able to help Jen, then that might be the reason I am here. All I really did was listen and understand exactly how she was feeling. There definitely are challenges, and we learn a lot about ourselves. I hope Jen makes it all the way to Santiago and finds that every step was worth it. If only we could catch up with Jen and Grace! Unfortunately it looks like we have to stay one more day in Carrion. Thanks for writing! You are doing it!!!!! Muy bien mi amigos. How could it possibly get better without a few moments of feeling hard work? You are inspiring us all at home as we follow your amazing blog and phenomenal pics. Just seeing you both on the Camino makes my heart swell. You are fulfilling your hearts desire. That takes courage my dear friends. Buen camino, Buen camino Buen camino, Buen Camino!!!! Sending love and reminders to have fun. You are awesome Peregrinos. Just imagine you could be in wedding chaos!!! Stay happy on the Camino. dress to try on for my fitting tomorrow. woohoo! Thanks for all your words of encouragement! If it wasn’t for challenges, we wouldn’t appreciate not having them. Everything is good, even the challenges. Have a happy wedding …Next weekend? Yowsers!! !